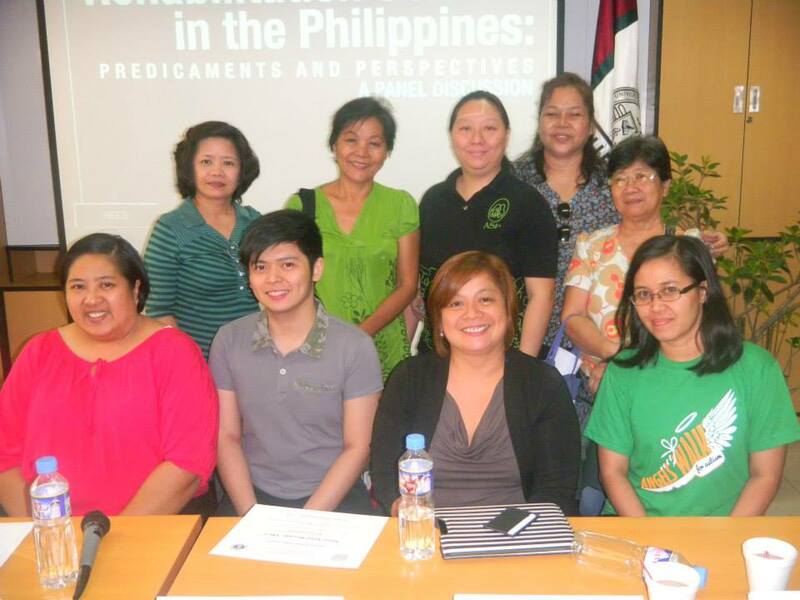 UP Speech Language Pathologists (SLP) facilitated an a panel discussion on “Rehabilitation Science in the Philippines: Predicaments and Perspective” with the participation of ASP UP CAMP Manila, ASP Hagonoy Chapter and ASP Pasay Chapter last 06 April 2014 at UP CAMP Building in UP Manila. The event was attended by 58 participants with included speech-language pathologists, occupational therapists, SpEd teachers and regular teachers. Exceptional Needs Expect, Center for Exceptional Needs. Participants discussed the practice of rehabilitation science in the Philippines and the different economic and political foundations influencing it. On Philhealth: Dr. Anawi D. Tolentino, ASP Hagonoy Chapter President shared how some PWDs cannot avail of Philhealth benefits because they are already orphans and they are not beneficiaries of their siblings. These PWA patients may avail of Point of Care of Philhealth once they are hospitalized. Doc Anawi suggests that parents enroll PWAs under Philhealth therefore they are able to become member on their own. On SpEd in Public Schools issue: There are still a number of municipalities which do not have a special education program in their district schools, contrary to the stipulations of the Magna Carta of Persons with Disabilities. The partnership with the Department of Education is important to addressing the educational needs of our children. Parents must write to government officials and school administrators to address the needs of the community. The limited professional services -- from speech and occupational therapists -- are rooted in the low number of practising professionals;and can be addressed by the expansion efforts by colleges and universities. About the author. Dr. Anawi D. Tolentino is the President of the ASP Hagonoy; and a practicing physician.